One of the things I look forward to most about the holidays is having days off to truly unplug and relax. Most of all that means extra time to enjoy with Adam and my family, which means sleeping in and admittedly staying in pajamas far longer than is typically acceptable. 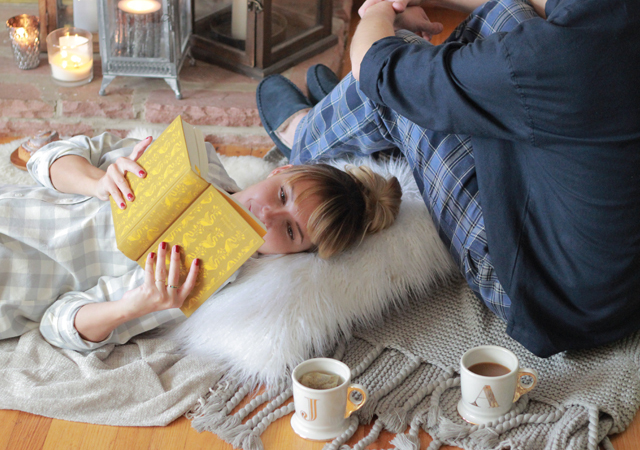 Whether it’s the morning after Thanksgiving and you’re still in a food coma or you’re having a present wrapping/holiday movie marathon – cozy sleepwear is a must have for Adam and I this time of year. So bring on the flannel, the furry lined slippers and the monogram mugs filled with chai tea (for me) and black coffee (for him). Since it has quickly started to feel like winter in New York, this plaid flannel nightshirt (which comes in 5 festive plaids and prints!) is exactly the sort of thing that feels super warm and cozy but also cute enough to wear just hanging out around the apartment. While Adam’s go-to is classic plaid flannel pants and a coordinating button down shirt. Plus these metallic slide slippers for me and suede moccasin slippers for him. Both faux fur lined.. because, aforementioned winter. And both of which can be monogrammed making them a cute gift for just about anyone on your list. There’s honestly nothing more luxurious to me than having an entire morning to spend cozied up together, reading, chatting, sipping hot drinks and indulging in a cinnamon roll or two. Hope you all have time to do the same with loved ones this holiday weekend!